The “LED” display has been the source of much confusion in the tech world over the past couple of years. There is some clarification due, particularly pertaining to exactly what an LED display is – and why most LED displays on the market today are not true LED displays. What is a true LED display? In a true LED display, each pixel is an individual LED – this means that a 1080p LED display would contain over two million LEDs! A common form of true LED display is the OLED (Organic LED) display – in this type of display, light is generated using layers of organic compounds within the pixels themselves. Since each pixel has to be capable of outputting a large number of colors of light, the LEDs in OLED displays are more complicated to manufacture than the run-of-the-mill LEDs that we see on most electronics. OLED displays are more power efficient, brighter, and can reproduce a wider range of colors than currently possible with LCD technology. OLED displays, although expensive, are slowly becoming available for purchase. At least two major display companies are planning on releasing OLED televisions in 2012, but prices are in the $10,000 range for a 50” screen. Another major electronics company launched a 25” OLED computer monitor last year, with a price of around $30,000 at launch. That same display is currently selling for around $20,000. OLED prices are expected to fall drastically in the coming years, but for now they are far out of the reach of most consumers and industrial users. What about the “LED” displays for sale at the store? An LED-Backlit LCD display is, in most ways, identical to a standard LCD display. The differentiator is the backlight – the light source used to illuminate the pixels on the screen. Because the pixels in an LCD display cannot generate their own light, they need to be illuminated by an external light source in order to remain visible. This is accomplished by placing some sort of light behind the LCD panel – traditionally, this has been a CCFL (Cold Cathode Fluorescent Light). A LED-Backlit LCD uses bright white LED lights instead. 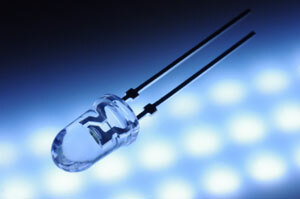 There are many advantages to using an LED as a backlight for an LCD display. LEDs are more power-efficient than CCFL, so an LED-backlit LCD will generally draw less power than a CCFL-backlit LCD of the same size. LEDs are also capable of outputting light which is closer to being perfectly white – a factor which is important for being able to accurately reproduce colors. Longevity can also be taken into account – the MTBF of an LED is generally much longer than that of a CCFL, so failures caused by worn-out backlights will be less common with LED backlit displays. While LED-Backlit displays on the market today are still using LCD technology, they still provide many advantages over the old CCFL-Backlit LCDs and should not be written off simply because they aren’t a true LED display.